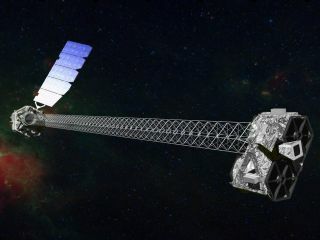 Artist's concept of NuSTAR on orbit. NuSTAR has a 10-m (30') mast that deploys after launch to separate the optics modules (right) from the detectors in the focal plane (left). The mission's launch is now scheduled for no earlier than March 21, 2012. A new NASA space telescope equipped with X-ray camera eyes is just days away from launching into space in the hunt for black holes. On Wednesday (June 13), the Nuclear Spectroscopic Telescope Array (NuSTAR) spacecraft is due to take off inside an Orbital Sciences Pegasus XL rocket that will be carried aloft by an L-1011 Stargazer aircraft. The rocket-carrying airplane will depart from the Kwajalein Atoll in the central Pacific Ocean and launch the new space observatory at 11:30 a.m. EDT (1530 GMT). The spacecraft and launch vehicle arrived at the launch site Thursday (June 7), and are looking good for an on-time launch, mission managers said. "Hopefully at 3:30 in the morning Thursday here Kwajalein local, we'll have our drop of the Pegasus XL and the NuSTAR mission on its way to its intended orbit," Omar Baez, launch director at NASA's Kennedy Space Center in Cape Canaveral, Fla., said during a press briefing today (June 11). Forecasters predict an 85 percent chance of good weather for the launch. "It opens up a new window into the high energy universe," said William Craig, NuSTAR instrument manager at the University of California at Berkeley. NuSTAR is utilizing the Pegasus XL rocket in part to take advantage of its ability to launch from a portable plane. The booster will be dropped from its carrier plane about 120 miles south of the Kwajalein Atoll in order to position NuSTAR in an eventual orbit close to the Earth's equator, which should provide a viewing vantage with minimum interfering background light. Launching from an airplane, rather than a ground launch pad, is also cheaper because it takes less fuel to climb to orbit from midair than from the ground. The NuSTAR mission is part of NASA's relatively low-budget Small Explorer class of missions.